Can Samsung challenge Apple for smartwatch dominance? In the past, the quality of Samsung's wearables was questionable, just look at theGear 2, Gear Live, andhideous Gear S.
But when the Korean company unveiled the Gear S2 just before IFA 2015, it surprised us with a smartwatch which actually looked wearable. Has Samsung broken tradition and built a smartwatch worthy of a place on your wrist, or is the Gear S2 destined for the sock draw? We'll start where we always do, with the design, an area where Samsung has struggled in the past. The Samsung Gear S may have been very smart, with no reliance on a smartphone, but no one in their right mind would want to wear it. Thankfully the Gear S2 is much more of a looker, with it's fully circular screen, clean aesthetics and a futuristic design which pays homage to traditional watches. The watch feels solid and well made, with durable (if not premium) materials. The rubber strap and metal casing is comfortable to wear, and it's reasonably lightweight, coming in at 47g. There isn't a huge number of design options, with the standard S2 only available in black or white. The Samsung Gear S2 measures 42.3 x 49.8 x 11.4 mm, which is larger than some competitors, but due to a less bulky design, it feels smaller. Interacting with the device is primarily done with the rotating bezel around the screen. It's not an exaggeration when we say the bezel is a breakthrough in smartwatch interaction. It's similar to Apple's Digital Crown, but much more intuitive. Navigating the UI can be done with a fluid twist of the bezel. It's brilliantly simple, and we expect to see it in more smartwatches soon, sorry Samsung. Of course, you can also navigate the UI using the 1.2-inch circular touchscreen. The Gear S2 features an sAMOLED (that's not a typo, the s stands for super) display with a resolution of 360 x 360 pixels. That gives a density of 302ppi, which matches the 42mm Apple Watch as the sharpest resolution on a smartwatch. The screen is incredibly clear and vibrant, certainly one of the best I've seen on a smartwatch to date. The Gear S2 is equipped with a 250mAh battery, which is quite a bit smaller than most smartwatches on the market (most have 300mAh or higher). Despite being comparatively small, the battery lasts around two or three days, depending on usage with 'screen always on' turned off. That's better than a majority of the smartwatches I've tested. Although, with 'screen always on', the watch will last around 1.5 days. There's also a battery saving mode, which reduces the number of features to stretch out the battery life a little longer. It's very effective, and one fo the best I've seen. The battery life if good, better than many Android Wear rivals, but it's still not close to the fives days we're praying for (although realistically, that's not going to happen any time soon). The charging method is very similar to that of the Moto 360, the watch sits upright, and charges wirelessly. It's a neat dock. The Gear S2 comes packing some pretty high-powered internals, although with a 1GHz processor, on paper it's slightly slower than the high-end Android Wear devices which run on 1.2GHz chips. In reality the difference is negligible, I was really happy with the performance of the Gear S2, navigating the UI is fast with minimal lag. The Gear S2 also has 512MB of RAM, and 4GB of storage for music and apps. In terms of sensors, the watch includes an accelerometer, gyroscope, heart rate sensor, ambient light sensor and barometer. There's no GPS, so it's not going to be a serious running watch alternative. The Gear S2 connects to your smartphone with Bluetooth 4.1 and also sports Wi-Fi and NFC. The Samsung Gear S2 can do everything most other smartwatches can do, count steps, alert the wearer to smartphone notifications, and run various apps. Where the Gear S2 really differentiates itself from most of the watches out there, it's with the operating system. The watch runs Tizen OS, Samsung's own operating system. Tizen is a nice mix between Apple's Watch OS 2 and Android Wear, taking the best of both operating systems to create what I think is the best watch OS around. It's not as fiddly as the Apple Watch OS and there's a lot less swiping required than Android Wear, mainly thanks to the rotating bezel. Infomation cards can be viewed by rotating the bezel clockwise, and notifications can be viewed by rotating it anticlockwise. It's a really slick system, and very intuitive to use. Unfortunately using Tizen does also bring some downsides, chief among which is the number of apps created for the system. Right now, there's just not that much available. It's a shame, but hopefully will get better with time. Unlike older Samsung devices, the Gear S2 is now compatible with any Android phone running 4.4. That's great, as it means you're not tied down to a Samsung smartphone. The company has even stated iPhone compatibility could arrive some day as well. However, if you want to use Samsung Pay, the contactless payment software, you will have to get a Samsung smartphone as well... but don'd hold your breath. 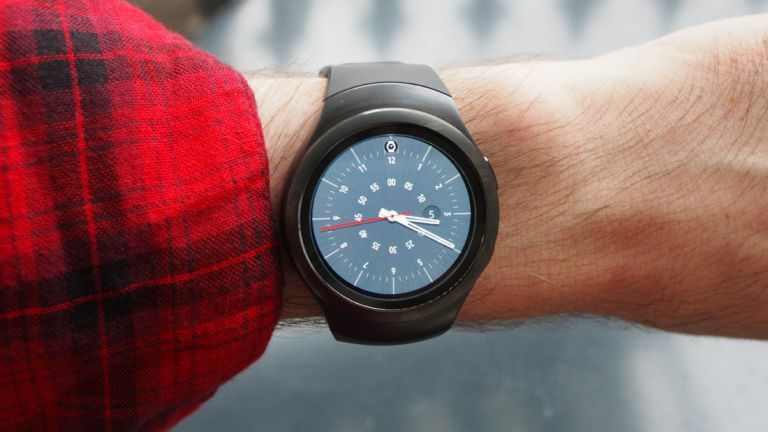 The Samsung Gear S2 is without doubt one of the best smartwatches I've ever used. The innovations that Samsung introduced with the device are meaningful, and change the way I interact with smartwatches. It's a well-made device, the rotating bezel is amazing, and it features one of the best screens I've seen on a smartwatch. Tizen is also worth a mention, it's a slick yet powerful OS. The only thing holding it back is the number of apps available. If you have an Android smartphone and want one of the best smartwatches available for it, the Samsung Gear S2 should certainly be taken into consideration.